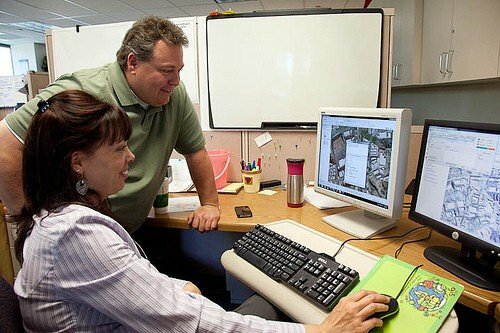 Serving the geospatial needs of an entire city keeps the GIS group at the City of Santa Clarita busy. 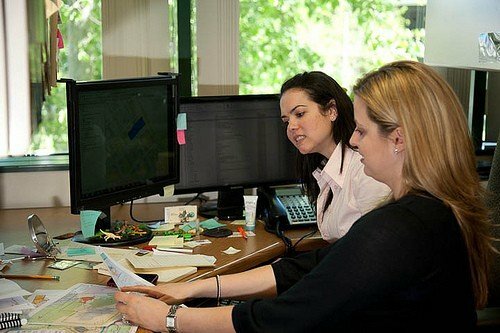 From zoning maps to inventorying trees to tracking the city’s traffic signs, the entire City staff frequents the GIS shop for maps and spatial analysis. 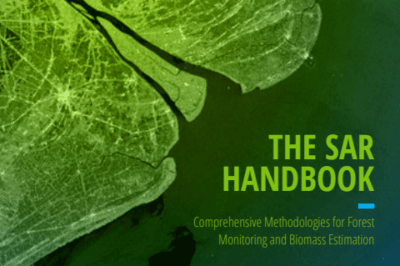 Previously, I profiled the GIS group’s project to use near-infrared aerial imagery to inventory the city’s oak trees. 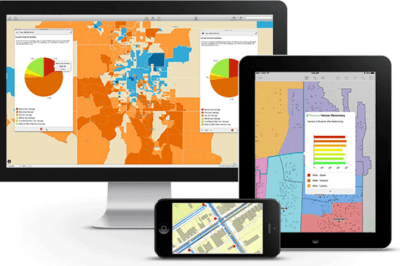 For a vintage look at the City’s GIS, check out this article by Matt Rosenberg: An Interview with a GIS Specialist. Kristina Jacob, a GIS specialist for the city and photographer, provides a peek at the daily activities of some of the members the GIS group and city staff in this photo essay. Denise Lellan, Administrative Analyst, works with Kristina Jacob on a map of the under construction Newhall Library. Denise Lellan is one of the many City staff customers that utilize the GIS group on a daily basis. Kristina works with Casey Bingham, Administrative Analyst for the City Manager’s Office, on a map of northern Los Angeles County for a city council presentation, one of many projects that come through the GIS department from the City Manager’s Office. 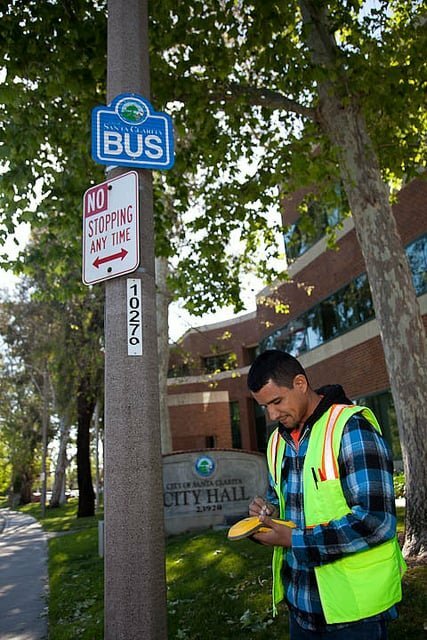 Steve Rodriguez is one of the City’s Street Maintenance staff that works with GIS to collect the street sign inventory to fulfill a requirement from the Federal Highway Administration that goes into effect in 2012. 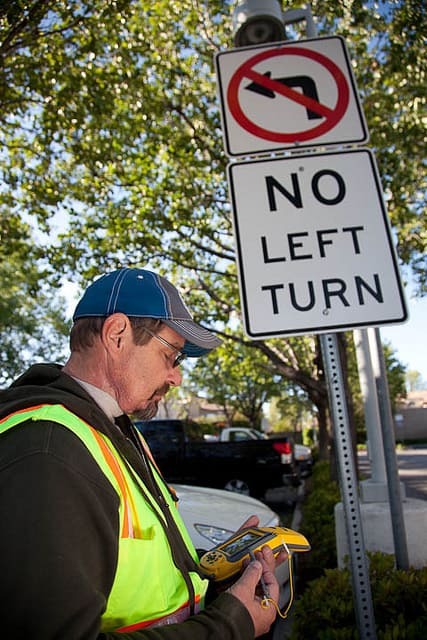 Agencies having jurisdiction over the road signs have to establish a system for maintaining the general condition of road signs and making sure that minimum retroreflectivity levels for sign sheeting is maintained (to ensure the signs can be adequately seen at night). The City must have an asset management system in place which tracks the inventory of the signs and also the history of the maintenance of the signs such as if it gets knocked over, vandalized or is just old and needs to be replaced. All of this info will be used to keep an accurate record of the signs history to protect the City is the event of tort cases. Bill Hurst GPS’es signs using a Trimble GeoXH. The signs that are GPS’ed will go into a database that will be used to track the locations and maintenance histories of all signage. Intern Deanna Wilson and GIS Technician Anthony Calderon geocode a list of hazardous material locations for modeling in FEMA Hazus, a national standard methodology for estimating potential losses from earthquakes, floods, and hurricanes. This data will help Santa Clarita’s GIS department prepare models for possible earthquake damage. 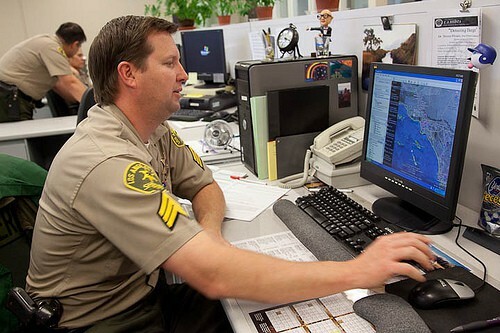 Sergeant Darren Harris shows how the Los Angeles County Sheriff’s Department uses Google maps to add layers for crime visualization and reporting. 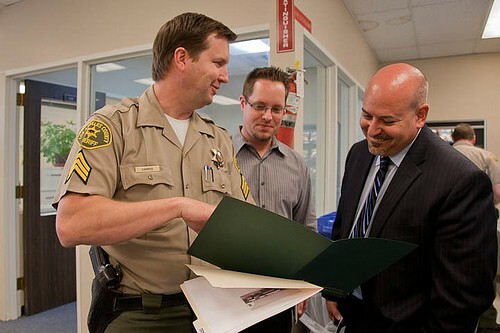 A meeting with Sergeant Darren Harris of LASD, Kevin Tonoian, Technology Services manager for the City of Santa Clarita, and Ryan Drake, Webmaster for the City of Santa Clarita. This meeting is to assess the use of SMARTboard technology for the Sheriff’s mapping display. 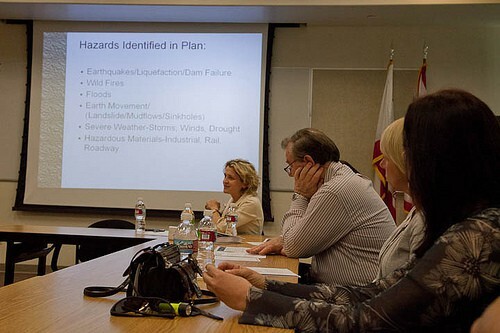 Hazard mitigation meeting- Community stakeholders met with City staff to discuss annual mitigation goals and action items. 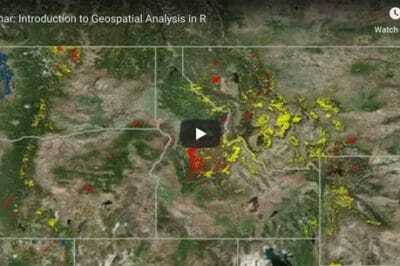 Action items for the GIS team include: acquisition of important pipeline data, creation of a hazardous materials layer in coordination with Los Angeles County Fire Health Hazmat, and sending GIS staff to Hazard US (HAZUS) mitigation training through FEMA. Deanna Wilson works with a large printer known as a plotter. This plotter is a must for the large maps that the GIS group prints daily for staff to use to visualize their projects.